Yesterday was a beautiful day. Not only due to the wonderful weather we had, but for the sure fact that family members decided to spend, for the most part, the entire day at our house. Grandma and Grandpa took all of the grandkids to a couple of parks, and out to lunch. What a relief and great feeling that was! My sister-n-law decided to organize a few closet spaces that really need help (game closet, kids closets), and my wife decided to finish some painting. Me, you ask? What did I do? Besides teaching my nephew how to ride a bike for the first time, I decided to make a great meal for the family. Due to the beautiful weather, grilling was in order. 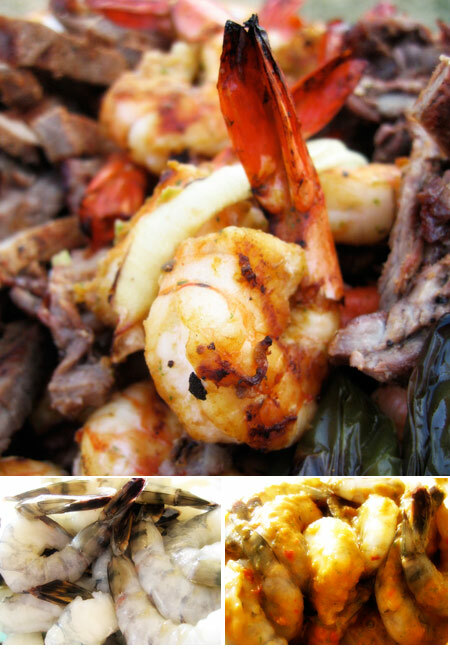 I already had a couple of skirt steaks marinating for my carne asada, and all of the fixings, but I wanted to turn it up a bit, and do a steak and shrimp grill. As I was already leaning heavily on Mexican dishes, I decided to do a Shrimp Diablo marinade, but instead of serving over rice, I was going to put them onto skewers, then grill them, serving them as tacos. To a blender, add in all of the ingredients, except the shrimps. Blend really well until you have a nice puree. To a large bowl, add the cleaned shrimps, and pour over the sauce. Let this marinate for at least 4 hours. The longer the better. If you are using wooden skewers, soak them in water for at least 30 minutes. I have some nice metal skewers that I use, so I placed about 6 shrimps on each skewer. Reserve the marinade and add to a pan. Preheat your gril to medium-high heat. With some tongs and oiled paper towel, lube your grill grates. Heat a small pan, and add the reserved marinade. Bring to a boil, and simmer for about 5 minutes. You can use this as a a sauce for the tacos. Add the skewers and cook a few minutes per side. the goal with cooking any shrimp is to never overcook them. Turn over and cook an additional couple of minutes. Once they are a opaque throughout, you are good to go. You can serve these on the side, or fold them up in some nice flour tortillas. The Shrimp Diablo has a killer flavor. Not really to instense with heat, so don’t be scared of the the name!